Preheat oven to 350°. Lightly spray baking sheet. In a medium bowl, lightly spray tortilla strips with cooking spray and toss with chili powder, salt and pepper. Spread tortilla strips on baking sheet and bake for 10-15 minutes, tossing once halfway through. In a large sauté pan, cook ground beef. Drain fat and return ground beef to pan. Add taco seasoning, cook according to package instructions. Divide salad among four salad bowls. 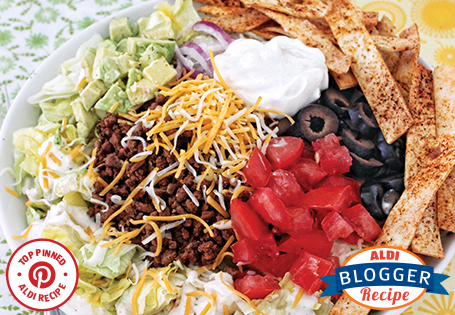 Top with 1 tablespoon of dressing, ¼ of taco meat and ¼ of cheese. Divide remaining ingredients among salads. Top with tortilla strips before serving.